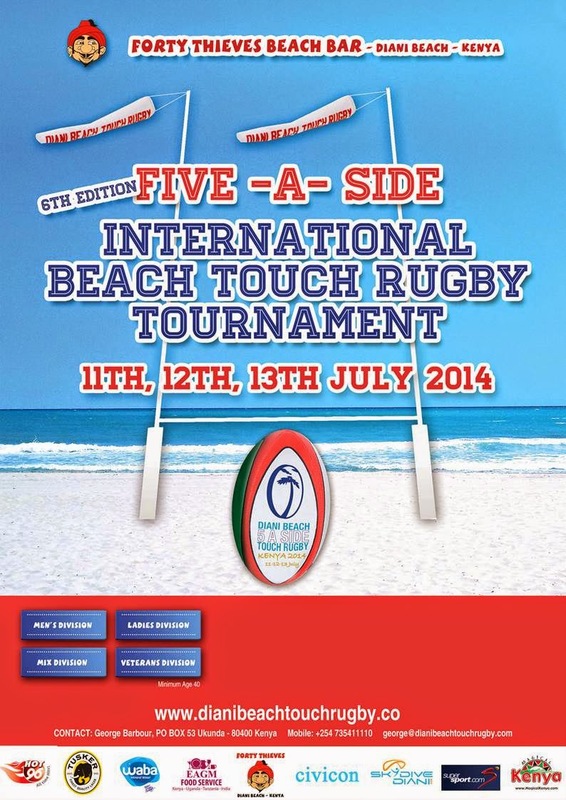 The 2014 edition of the annual Diani Beach 5-a-side Touch Rugby Tournament – the sixth edition of the event – will be held on 11th, 12th and 13th July 2014 on Diani Beach, considered by many as one of the best beaches in the world with five kilometres of pristine sand, clear blue waters and coral reef. It is the perfect venue for an annual Beach Touch Rugby Tournament that is not only hugely social but also very competitive with the standard of Rugby getting better every year. The final last year was very exciting and only concluded with a sudden death try after three periods of extra time. There are four categories of teams; men’s, women’s, mixed and veterans. Mixed teams must include at least 3 ladies and veterans players must all be over 40. George Barbour an ex East African Tuskers Veteran – and his team of organisers conduct a 2 days 1 night programme on 4 pitches. The tournament starts Friday evening under flood lights, games are played Saturday all day and Sunday see the finals finishing early afternoon. Beside the tournament, Forty Thieves Beach Bar offers a wide range of entertainment over the weekend for everyone to enjoy, not to mention the Football World Cup final games happening on that week end that will attract a large audience at the beach bar. We expect the same number of teams as last year: 28 Teams coming from all over Kenya (Nairobi, Nanyuki, Naivasha, Kijabe, Mombasa, Malindi, Diani) and look forward to welcome the teams from Swaziland, Tanzania and UK again along with all the newcomers. Age range is between +21 and 50+ in age Rugby players with a large group of supporters and audience. It is an occasion for Rugby players to share an entertaining weekend, of sporting challenges, physical challenges, catching up with old friends and making lots of new friends too. Diani Beach Touch Rugby together with the Rugby Patron’s Society support the Age Grade Program to engage with underprivileged children to give them something positive to focus on and to identify and nurture talent at an early age, maintain focus, develop rugby skills and prevent indulgence in drugs and/or the possibility of becoming street children. Up to date the Diani Beach Touch Rugby has raised KES 800,000 for this worthy cause. area. The players developed their initial skills from the Diani Beach Touch Rugby tournament over the last few years, organized by George Barbour of Forty Thieves Beach Bar. These young players have been requesting for a more formal approach to the 15 a side full contact game, and with their enthusiasm and that of rugby coach David Nolan, it has now materialized and we hope that it will become one of the top Rugby Clubs of the future. Many of these keen players are young and of very limited means and need all the help and encouragement that we can find, both in skilled training and financial support. Their base is the Ukunda Show ground, which need to be upgraded and brought up to a satisfactory level so as to be usable for future serious rugby and soccer games for the benefit of all. Please join us to the 2014 DIANI BEACH TOUCH RUGBY.